Lower eyelid malposition is one the most common and devastating complications of lower eyelid blepharoplasty; it can be temporary or permanent. Surgeons who perform blepharoplasty should feel comfortable identifying those patients at risk for postoperative scleral show and ectropion. Surgeons performing a blepharoplasty can choose from many available surgical options. Incisions can be placed on the skin or on the conjunctival surface; fat can be removed, repositioned, or added; and canthal support can be established by tightening, anchoring, or reconstructing. To choose the appropriate procedure to provide lower eyelid canthal support, the surgeon must understand the etiology of lower eyelid malposition and have a thorough knowledge of periorbital anatomy (see Relevant Anatomy). For detailed descriptions of various blepharoplasty procedures, see the Eyelids section of the Medscape Reference Plastic Surgery journal. For information on many kinds of aesthetic procedures, visit Medscape’s Aesthetic Medicine Resource Center. The pathophysiology of lower eyelid malposition is multifactorial. One can think of this process as an imbalance between gravity and the lower lid elasticity and canthal support. Involutional or senile ectropion is due to laxity of the lateral and medial canthal tendons. Gravitational forces acting upon excessive eyelid skin and prolapsed orbital fat may distort the lower eyelid. Cicatricial forces can produce an ectropion after prior surgical dissection. Excessive skin resection from the eyelid can retract the lower lid. Margin reflex distance-2 (MRD2): The distance from the corneal light reflex to the lower lid margin should be no greater than 5.5 mm. Positive vector relationship: The most anterior portion of the globe lies posterior to the lower eyelid margin, which lies posterior to the anterior malar eminence projection. Neutral vector relationship: The anterior globe, lower eyelid margin, and anterior malar eminence all lie in the same vertical plane. Negative vector relationship: The anterior globe lies anterior to the lower eyelid margin, which lies anterior to the malar eminence. This situation puts the patient at increased risk for lower lid malposition. Lateral canthus to orbital rim distance: A patient with deep-set eyes usually presents with a distance less than 1 cm. A patient with prominent eyes usually presents with a distance greater than 1 cm. Canthal tilt: Assess which canthus (medial vs lateral) lies in a higher horizontal plane. This is important for correction of horizontal lid laxity. Lower lid eversion: This can be divided into 4 subtypes. Assessment of the malar fat pad: Lower lid retraction may present with descent of the malar fat pad. Midface lift procedures maybe combined with lower lid surgery. Midlamellar cicatricial retraction: Manual displacement of the lower lid in the superior direction should normally bring the lid margin to or above the level of mid pupil. Limited movement in this direction may indicate midlamellar scarring. Medial canthal laxity: Distract the lower lid laterally. Normal displacement should be 0-1 mm. Lateral canthal laxity: Distract the lower lid medially. Normal displacement should be 0-2 mm. Horizontal lid laxity: Perform the distraction test or snap test to assess horizontal lid laxity. See the image below. Snap test: The examiner pulls the lower lid inferiorly and releases. The speed at which the lid returns to normal position is assessed. Slow movement indicates canthal laxity. Distraction test: The examiner uses his or her thumb and index finger to displace the lower lid anteriorly. Abnormal laxity is present if the lower lid can be displaced more than 8 mm. The lower eyelid is divided into 3 separate layers. The anterior lamella consists of skin and orbicularis oculi muscle. The middle lamella consists of the tarsus, superior part of capsulopalpebral fascia, and orbital septum. The posterior lamella is made of conjunctiva and capsulopalpebral fascia. The orbicularis oculi muscle has 3 components, consisting of the pretarsal, preseptal, and orbital portion. This muscle can be divided into an extracanthal region and a canthal region. The muscle in the canthal region is critical for eye closure with blinking, lower lid tone, and lacrimal pump mechanics. For a more detailed discussion, see Medscape Reference article Eyelid Anatomy. Jelks GW, Jelks EB. Preoperative evaluation and treatment of lower lid ectropion following blepharoplasty. Plast Reconstr Surg. 1990. 85:971. Massry GG. Comprehensive lower eyelid rejuvenation. Facial Plast Surg. 2010 Aug. 26(3):209-21. [Medline]. American Society of Plastic Surgeons (ASPS). 2000/2006/2007 National Plastic Surgery Statistics. ASPS Web site. Available at http://www.plasticsurgery.org/Media/stats/2008-cosmetic-reconstructive-plastic-surgery-minimally-invasive-statistics.pdf. Accessed: June 18, 2009. McCord CD Jr. 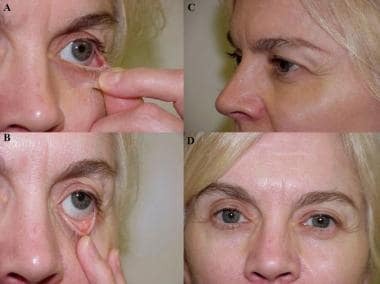 The correction of lower lid malposition following lower lid blepharoplasty. Plast Reconstr Surg. 1999 Mar. 103(3):1036-9; discussion 1040. [Medline]. Jelks GW, Jelks EB. Repair of lower lid deformities. Clin Plast Surg. 1993. 20:417. Zide BM, Jelks GW. Surgical Anatomy of the Orbit. New York: Raven Press; 1985. Spinelli HM, Jelks GW. Periocular reconstruction: a systematic approach. Plast Reconstr Surg. 1993 May. 91(6):1017-24; discussion 1025-6. [Medline]. Baek JS, Choi SC, Jang SY, Lee JH, Choi HS. Comparison of Surgical Outcome Between Quickert Suture and Quickert Suture With Modified Lateral Tarsal Strip in Involutional Lower Eyelid Entropion. J Craniofac Surg. 2016 Jan. 27 (1):198-200. [Medline]. Jelks GW, Glat PM, Jelk EB, et al. The evolution of the lateral canthoplasty: techniques and indications. Present at the American Association of Plastic Surgeons, 74th annual meeting, San Diego. April 30 to May 3, 1995. Fagien S. Algorithm for canthoplasty: the lateral retinacular suspension: a simplified suture canthopexy. Plast Reconstr Surg. 1999 Jun. 103(7):2042-53; discussion 2054-8. [Medline]. Hester TR, Codner MA, McCord CD. Subperiosteal malar cheek lift with lower blepharoplasty. McCord DC, Codner MA, Hester TR, eds. 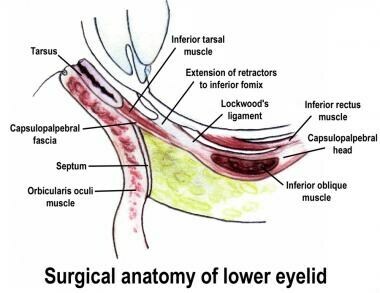 Eyelid Surgery: Principles and Techniques. Philadelphia: Lippincott-Raven; 1995. Kim DY, Lelli GJ Jr. Delayed orbital hematoma after lateral canthoplasty. Ophthal Plast Reconstr Surg. 2010 Nov-Dec. 26(6):481-3. [Medline].